Remember that unprovenienced and underprovenanced Wari hide pouch that the Cleveland Museum bought from Sotheby’s last year? I wrote about this hide bag a few months ago when everyone was talking about other questionable acquisitions made by the Cleveland Museum. There was some general internet discussion that a whole host of poor buying decisions on the part of Cleveland were being eclipsed by the poor decision to buy an unprovenienced/underprovenanced Classical item. I was just surprised to see that bag again so quickly since, well, I thought it was weird ever since I saw it for sale. at least it has a 1940 provenance. 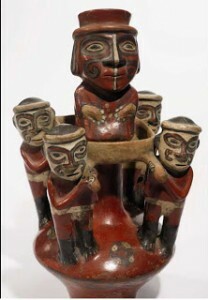 The pouch was offered at Sotheby’s as lot 108 in the 13 May 2011 African, Oceanic and Pre-Columbian Art Sale (N08749). The origins of the bag are unclear and it has no provenience and questionable (as published at least) provenance from before 1976 when it was pictured in Alan Lapiner’s tome. The photo in Lapiner is pretty terrible but it is on the same page as a Wari vessel, a figural group that is also now in the Cleveland Museum and was also purchased at Sotheby’s in the May 2011 auction as lot 109.1 The museum paid $146,500 for the pouch which is pretty wild. Not that I’ve ever seen a Wari hide pouch before, let alone seen one sold, but it is a memorable item and it was odd to see it turn up so quickly. Usually these things float off into the aether. But sadness: “We don’t really know who he is”, says Bergh. Well yeah. In all likelihood that pouch, (if ancient, there is always that doubt! ), was yoinked off the neck of a mummy. 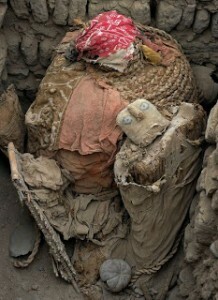 Señor Wari Mummy might just have been the guy ON the pouch! The pouch has human hair! What if the hair on the pouch matched the hair on the mummy? That would be awesome! Also, what was IN the pouch?! mummy looting then pretend it helps scholarship. But no. Bergh is somehow proudly highlighting a lack of context as if it were some mystical ancient archaeology mystery. No fair, Ms. Bergh, no fair! You don’t get to capitalize on the trickle down effects of a problem that you are actively supporting. That is just lame. Also, the fella on the bag doesn’t ‘symbolize the entire exhibition’. Sure he symbolizes much of the exhibition, which is largely made up of looted objects in private collections. But the government of Peru has loaned some archaeologically-excavated objects to Cleveland. Which, of course, brings up the question of why Cleveland needed to buy the weird bag in the first place if they can just work out super snazzy loans with Peru. Perhaps the worst part is this lady saying that the Wari have not been the subject of much scholarship and that she and her museum with their expensive hoard of looted objects is trying to attract scholarship to the Wari. Hey, friends and colleagues that study the Wari, just so you know the Cleveland Museum has your back. They know that what you guys need is for a US museum to give the thumbs up to collecting Wari material. No, they aren’t going to donate $146,500 to excavations at Wari. They aren’t going to use it to help facilitate the loaning and display of more objects borrowed from Peru (maybe the archaeologically excavated Lord of Wari regalia?). Nope, they are going to buy looted Wari items at great expense and put them on display. That, friends, is how you attract scholarship to the Wari. 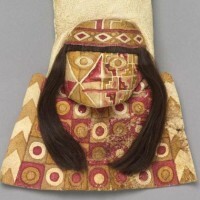 I’m going to go out on a limb and speak for everyone else working on the Andean Middle Horizon: please don’t pretend that the collection of Wari material helps we poor scholars who actually work on this stuff. 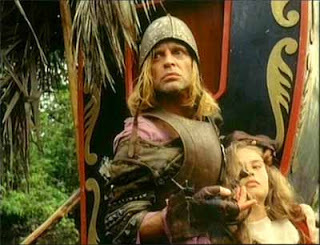 Ironically, they are showing Aguirre, the Wrath of God as an exhibition event. If you are in Cleveland, go and enjoy watching Werner Herzog’s take on a conquistador’s fall into madness as he searches for the riches of El Dorado. Lets just say that his attempt to plunder the ancient treasures of Peru doesn’t work out for him. 1. This one actually looks quite ‘good’. It has the typical fluffy provenance of “Christoph Bernoulli, acquired by 1949; Acquired from the above by 1960”, but it appears to have been illustrated in a publication by Julio Tello in 1940. No provenience offered but, I don’t have the Tello on hand, maybe he had something to say. The Cleveland museum paid $31,250 for it.